Grab a Copper Bird Feeder for the Merriest of all Gifts! Shiny, happy copper will light up a recipient’s face when the box is opened! How would we know this? 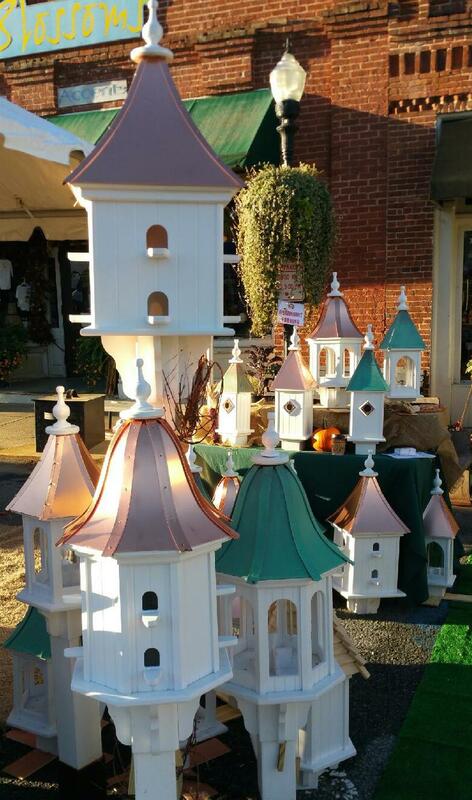 Recently at a local show, our copper bird feeders were the buzz of the day. Someone had even walked down to see what the “glow” was all about. Yes, they’ll glow in direct sunlight. 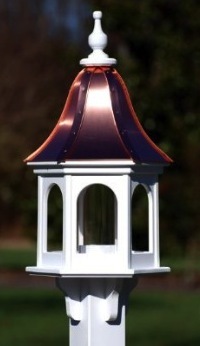 Gazebo post-mounted feeders are done in PVC/vinyl to make them completely inert. Impervious to the elements, the vinyl lasts for life, but the real beauty to us… they look like wood. Over the years many customers have told us of woes with their wooden feeders that have rotted. These were majestic, and beautifully crafted (and expensive too) but their life expectancy wasn’t quite commensurate with the price tag. We’ve not had one complaint nor return for these copper feeders and birdhouses in eight years, so we’re pretty darn confident in our product! From small to large, and huge capacity hoppers, we know the birds LOVE them too! Gracing the landscape with timeless elegance, architectural styles abound in different shapes with an aged patina copper finish as well. This is an acid wash done via heat process, so the color remains… 10-20-30 years down the road. The shiny roofs will stay that way for about 3-4 years before starting to weather. When copper weathers it gets dark, this aging process creates a very dark brown tone that takes many years to actually patina. The bright copper may be preserved (prior to weathering) with a quality copper polish applied every year. 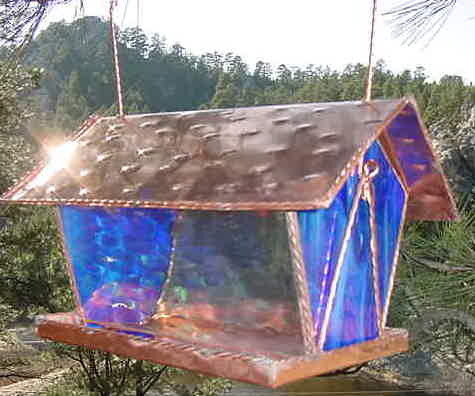 Another stunning copper feeder is done in stained glass, and guess what? It glows in the sun too! Hand made with the most vibrant glass colors, this one hangs to entice feathered friends. Both copper bird feeders provide plenty of perching space and drainage to keep seed dry. Using quality materials, both are meticulously crafted to last for life. A gift of nature offers usage everyday, by birds and recipients. A glance at the feeder has the capacity to remove one from swirling thoughts and to do lists! There’s no batteries and no plugs… which is what allows one to simply unplug! Larger seed feeders seem to be banished to the backyard, likely for the best viewing options. Sometimes on the side of a home, but you do occasionally see them in the front. 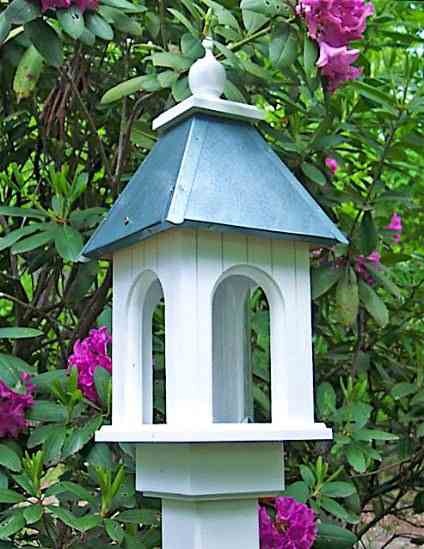 Some folks may place a beautiful birdhouse in the landscape… simply for the aesthetic. But those who actually feed the birds are serious! 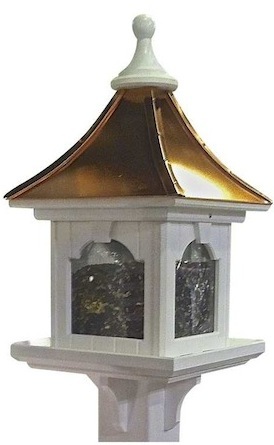 Enter the post-mount hopper bird feeder with ten-pound capacity and majestic appearance. A distinctive accent for the landscape, it’s definitely worthy of the front lawn. Because the roof is copper, and that’s actually vinyl/PVC (not wood) its appearance remains new. In fact it’s guaranteed against rotting, cracking or warping. Vinyl will not mildew, making it a healthier feeding surface for birds. Bacteria and mold have nowhere to settle, no deep, dark cracks or crevices in which to grow. 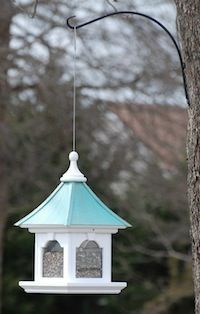 Hopper style feeders like these are one-time investments in the landscape with ideal functionality to entice feathered friends. They’re simple to fill, clean and are virtually maintenance-free. An aged patina finish is offered, as well as a hanging model. Lots of options with easy installation too – slides right on a standard 4×4 post, brackets included as shown. Save 10% through 3/15. Use code MC10 and feed the birds in high style… now come on spring! Tired of filling puny feeders every other day? With migrations under way bird feeders are likely to be seeing increased activity over the next few weeks. Food and fresh water greatly help migratory birds on their way south. These stunners pass for wood, in fact you’d swear they were wood… but they’re vinyl. The kind that’s used in housing construction, so you can bet it’s durable and everlasting! As is the copper roof, whether bright and shiny or aged patina, the 16-gauge copper (with brass rivets) also lasts a lifetime. These feeders will never warp, crack, mildew or split to boot. Now for the best part… (drum roll please) the hoppers are definitely whoppers! In two sizes that are both fairly large, these hopper bird feeders hold 10 and 20 lbs. of seed. 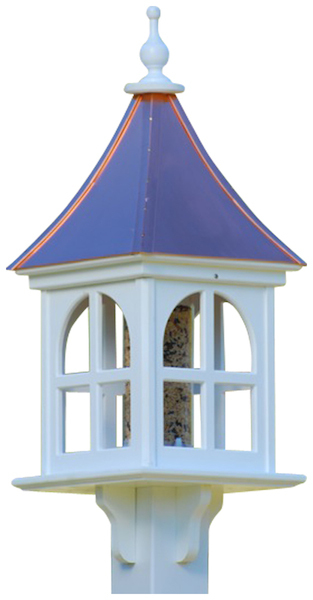 The traditional post mounted feeder is complete with decorative brackets (also vinyl) and a newer hanging style offers more flexibility for placement in the landscape. Even the finials are a composite resin to ensure there’s no deterioration whatsoever. 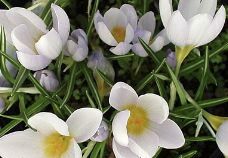 There are houses to match, and lots of folks purchase them for the aesthetic flavor, a timeless elegance in the garden. But it’s the folks who purchase feeders who actually feed the birds! So if you’re looking for a really large capacity feeder… look no further! Probably a little more than the planned spend, we can guarantee these feeders will never require maintenance and will certainly never need to be replaced. For a thorough cleaning, simply take the garden hose to it with cloth in hand. For any build-up of environmental grime, a little soapy water is all it takes to revive the crisp white color. If there were ever a product we couldn’t be more proud to offer… it’s our time tested and bird-approved hopper feeders! Give dad a gift he’ll really enjoy and use… like everyday! If he’s a nature kind of guy who enjoys the outdoors and especially birds… these feeders are the bomb! Crafted with utmost quality, of durable vinyl/PVC. So what’s the big deal about vinyl? It absolutely lasts! These copper bird feeders are guaranteed for life, they’ll never rot like wood, warp, peel, split, crack or mildew. What you see is what you get too. The vinyl mounting collar below the base slides right on a 4×4 post, doink… done! The decorative brackets are already attached, even the finial on top won’t wear because it’s not wood. The surface has texture so it doesn’t look like plastic, a few folks have sworn these were wood! The copper stays bright for about four years before it even begins to weather, turning pretty dark before ever displaying the slightest hint of green. A copper lacquer may be applied if bright and shiny is your thing, say in 3 or 4 years down the road. Like that pretty patina color? Got ya covered with this version! 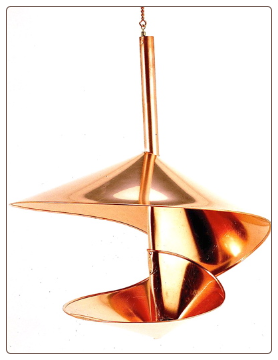 Its a rather large feeder and requires a good bit of space to display its elegance. 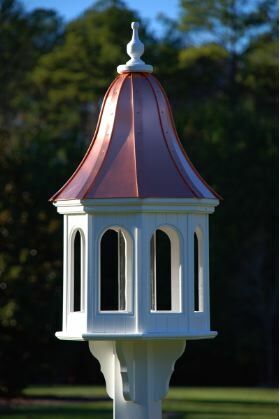 Gazebo feeders like these are bird-friendly as seed stays protected from the elements, and birds are sheltered while eating. A new large capacity feeder is done in a hopper style as opposed to the center feeder tube. The copper hopper’s huge and holds ten or twenty pounds of seed, depending on the model (two sizes). Yep, 10 lbs. of seed without having to refill as often. And if that’s not enough options, the hopper feeder comes in post-mount and hanging designs. They’re Our Biggest & Best Hopper Bird Feeders Ever! The bigger the hopper the more it will hold but don’t it believe because you are told they’ll never wear or start to look old a true statement of confidence-maybe a bit bold! New for 2104, large and extra huge capacity hopper bird feeders that will have you doing way less filling and more time relaxing & enjoying backyard birds. Not any old hopper mind you, our best selling feeders for six years straight just got even better! So what’s fuss? Although these may look like wood, they’re done in vinyl, which means they will not deteriorate. No warping, mildew, rotting, peeling, cracking or splitting… it’s guaranteed! It took a long time asking and begging to create something besides our original gazebo feeders. They’re quite stunning, but a tube only holds so much seed. If you’re serious into birds like us… you know what we mean. Even the smaller size hopper accommodates ten pounds of your favorite seed mix, and we’re talking the chunky nut mixes that birds love so much. With a majestic copper roof, these large capacity hopper feeders come in hanging and post-mount styles, and the copper is always available in traditional or patina on each model. Post mounted feeders come with a vinyl mounting collar and decorative brackets as shown – at no additional cost. The best part is that it slides right on your standard 4×4 post. Large seed tray invites lots of feathered friends to feed at once, and offers ample drainage to keep seed dry. Custom made to your liking, our new vinyl hoppers are by far the largest capacity feeders out there. And ready for this? The larger size is a monster – holding 20 lbs. of bird seed! Now that doesn’t mean one has to fill them all the way, the square design itself is new, and a nice option with its clean lines and an architectural appeal. Still in the making below, we especially love the generous seed ports. Look closely at the material, a few customers have called over the years insisting these were wood. No shiny plastic-looking stuff here… first class all the way, beautiful in the landscape and made to last! Elves are Rockin’ a Copper Bird Feeder or Two! 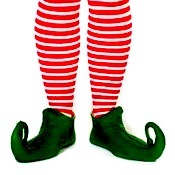 Our elves are definitely NOT on shelves... they’re busy rockin’ out the coolest holiday gifts yet! If you’ve waited a little too long to decide on a way nice, impressive gift for that special someone… don’t fret. Sometimes good things really do come to those who wait, because instead of settling, you just know when you’ve found the right thing. In stock and ready to ship Monday, you’ll find a stunning copper bird feeder or two… or three! So what’s the big deal about them? Well, anyone who feeds birds would admire them for their durability, their handsome architectural form, and most of all for their functionality. Sure all feeders are basically functional… but to varying degrees – believe us on this one! Backyard birding fanatics for 25 years, we’ve seen all sorts of feeders come and go. We’ve tossed a few in the garbage, and have our favorite going on 18 years of use. For a classic look in a traditional gazebo style feeder, you won’t find a nicer model on the market (shown at right). Should the mod flavor be more your style, then don’t miss the Spiral Copper Bird Feeder. In small or large, it’s sculptural art for the garden. Also handcrafted in the USA, this flowing design has no start or end. 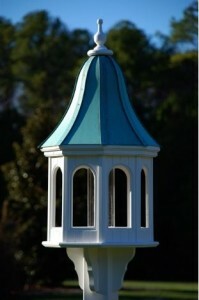 The larger top portion serves as a weather guard to protect food and birds from the elements. An open dish design is most versatile, allowing for a bevvy of offerings like seed mixes, suet chunks & nuggets, peanuts, even fruit in summer for migratory friends. And yet one more fitting the bill by the same master metal smith, it’s basically for shelled peanuts. 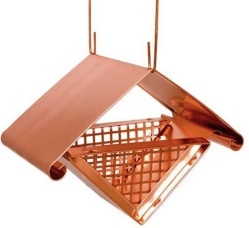 This architectural copper feeder has clean lines and a perforated screen with a solid roof to protect its cache for clingers and others to enjoy. Equally versatile for fruit and suet, home-made nesting materials work beautifully for early spring. These will entice feathered friends to take up residence at your place. Decorative mosses, pet hair, and feathers are a few favorites! Now if you want it badly enough by Christmas-and are willing to pay the gazillion dollars for overnight shipping… we’ll get it to FedEx in time! But think of how much premium seed that same money could buy for your new feeder? Here’s the plan: print out the picture, find the biggest box possible with the nicest bow, wrap up the picture and set it under the tree for Christmas morning. With full confidence we’ll guarantee some oohs and aahs with ear to ear smiles! Merry Christmas to you and yours and happy & healthy 2014! Two things a good feeder should do: feed the birds and last! Of course if it’s pretty and adds curb appeal, well… that’s a bonus! 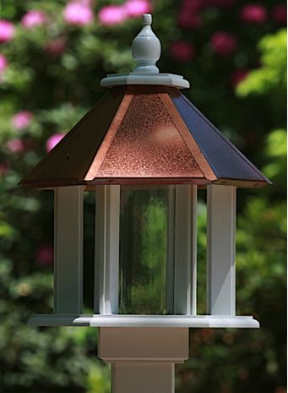 An elegant and more economical option for a copper bird feeder would be a galvanized metal, or aluminum surface. With custom finishes that look like patina or bright copper, it’s hard to tell the difference. Aluminum won’t rust – think about an airplane? 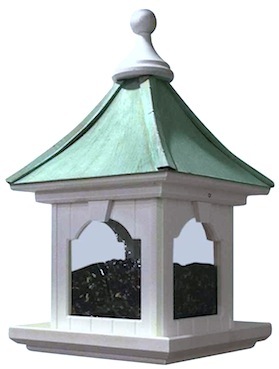 In the same durable vinyl/PVC, as our copper roof bird feeders, these gazebo styles will grace the landscape with simple elegance. Clean, architectural designs are pleasing to the eye and offer great functionality for feathered friends. Handcrafted in the USA, they’re built to last! And speaking of economical, sometimes the cheapest seed is not always best! Stuffed with fillers like milo and millet, much of it is likely to end up on the ground as birds forage for the “good stuff”. Better off buying the good stuff in bulk quantity as it costs less per pound. Using a no-waste mix, or sunflower hearts will also eliminate ground mess below the feeder. Another benefit: premium seed reduces the risk of unwanted visitors! The best deal on this type of birdseed can be found at most feed & seed stores. With all the rain we’ve had in the southeast, it’s common for birdseed that sits too long in feeders to become moldy… another waste of money. If birds aren’t consuming it quick enough – only fill the tube halfway. Better to make an extra trip to the feeder than to the trash! If it’s moldy, they won’t eat it, or if they happen to, birds will become sick with respiratory disease that spreads easily to the rest of the population around the yard. Often times, these diseases are fatal. Didn’t the ground hog see his his shadow? Did he not? I always get this confused, but was sure they said it would be an early spring! Snow showers in North Georgia early this morning… what the heck? Bluebirds are already nesting here, and other songbirds are dueling for territory and mates. Once the pairs are established, thus begins the nesting and chick-rearing process. This landscape sure does make for a picturesque scene though. 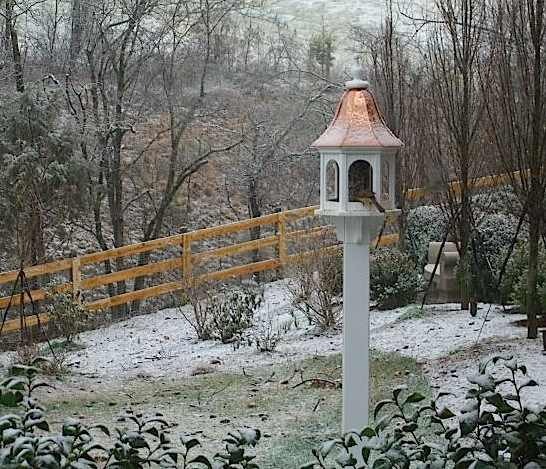 An elegant copper bird feeder set against frosted greenery, with movement and song from birds almost helps one through the dreariness of winters’ final stretch. 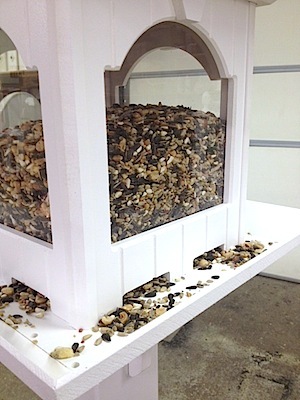 And speaking of bird feeders and winters’ end… we can’t wait because birds have been eating us out of house and home! Never thought of wishing for bugs – but they sure would help the food supply! Sunflower, thistle, suet, peanuts and more… omg, spending a small fortune on bird food the last two months! If time afforded the opportunity to actually sit and “bird-watch” life would be so much more relaxing! Lately, the food goes out at night, so it’s there for birds first thing in the morning…. because this is usually when I get to bed. The goal is to sleep before the birds start singing! By the way, this feeder’s actually about four years old, but it still looks the same as it did upon arrival. Now we think that’s a beautiful thing! It shimmers, it sparkles, and light dances off its panels with grace and beauty beyond compare. This stained glass bird feeder will never fade or warp, and for the most part… it’s impervious to the elements. A generous hopper holds 3 to 5 pounds of seed, depending on the mixes’ density. 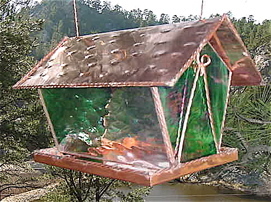 Hand hammered copper is used for the tray (with drainage) and roof, and the feeder’s topped off with a copper hanger. Wood is good, but a non-porous surface like glass or copper is much more resistant to bacterial growth. This means food stays fresher, making it a healthier feeder for your birds. In an array of stunning colors, this artist even welcomes custom orders. A few years back, there was a holiday version created using red and green panels. Tis the season~to remember feathered friends! And always know that a gift approved by Mother Nature is one that will actually be used and enjoyed! copper bird feeder is not wood! In four years we’ve seen three returns… and in my book that’s a beautiful thing. Happy customers are usually returning customers and nothing makes us happier! Sometimes I dread the phone call because I fear shipping and transit was a bit too rough and something broke. But today the call was an amusing repeat situation from about two years ago, and a great testament to product quality. 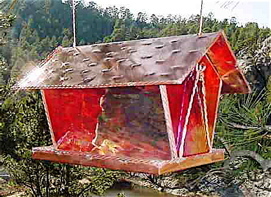 Mr. Dan O. in Palomar Mountain, CA., had ordered a gazebo style copper roof bird feeder, the one shown here actually. Now these are crafted in PVC/Vinyl, ensuring little to no maintenance, and many, many years of use. He proceeded to tell me he “ordered a vinyl feeder, but received a wooden one instead”. At least this time I wasn’t s so confused! “No… tap on it” I asked him. Explaining that the artist does not work with wood, I think he was convinced that the feeder was indeed vinyl. That’s part of the beauty of these copper roof bird feeders and houses – the vinyl is not “plasticy”, shiny, or cheesy-looking in the least. They actually do look like wood. By the way, the first person to let me know that his feeder was made of wood rather than vinyl, hailed from (near my home town) Cape May, New Jersey. Boy… do I miss the beach.